Chop palak and clean it. Cook for 5-7minutes in a vessel with water, covering it with a lid. Meanwhile, chop onions, garlic cloves, and a piece of ginger. Grind them together, with some water, to form a consistent paste. 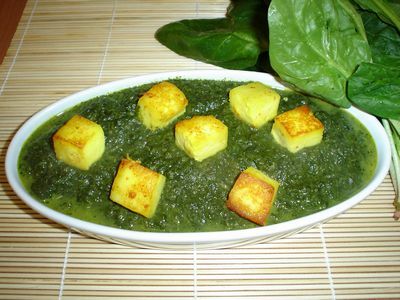 Strain off water from palak, and grind it to a fine paste. Take oil in a pan with medium flame, let it warm a little, then put the onion, ginger, and garlic paste and fry it till it gets brownish white (from white). Add half teaspoon garam masala, coriander powder, red chilly powder, and pinch of salt and sugar (according to your taste). Stir it as it gets brownish. Then add palak paste to it along with a little water, and stir as it cooks. Pour 2-3 tbsp of fresh curds, about 30-40ml milk, and 2 tbsp cream. Slice panner into small cubes, soak in water for couple of mitutes, and fry it in another pan to light golden brown color in oil. Then add it to palak. Stir for couple of minutes, and turn off the flame. Palak Paneer is ready! Mix atta with water in proper proportions to form a consistent dough, and let it so for 15-20min. Meanwhile, chop the washed potatoes into big sized blocks (helps in cooking faster). Cook them in a pressure cooker for three whistles (it took about 15-20min for this). Take them out, and mash them by hand. Along with it, add a pinch of garam masala powder, salt and chilly powder. Also add finely chopped coriander leaves. Mix all of them well. You can also add finely chopped green chillies. I avoided it. Now, roll a slice of dough to a thin circular shape. Make two of these, and oil it. Then, spread the mashed aloo on one of the unbaked bread/dough. Put another rolled dough slice over this, and roll it again. Bake it on a hot pan flipping it on either sides. Put a little butter over it, and Aloo paratha is ready! The ingredients for Aloo paratha serves 1 person. Time of preparation: Palak paneer and aloo paratha, together, 60-70 minutes. Difficulty level: Moderate to difficult. P.S. : My mom was directing me through out. She rolled the parathas for me, when i was getting restless and screwing it up.